Great attention to detail and total customer satisfaction are our goals. Our customers range from individuals looking for that one special gift to businesses wishing to promote their company name on embroidered apparel. We customize to fit any budget by offering the ability to purchase the exact amount of merchandise desired - with no minimum requirements. For groups and schools, we offer fund raising programs, including discounts on merchandise. The Embroidery Depot takes pride in providing our customers with the best possible service, working individually with them to produce a quality design and a professional finished product. Here at The Embroidery Depot, we work with state-of-the art computerized industrial embroidery equipment. Designs are digitized and created with you in mind, either by making small changes or creating a whole new look. 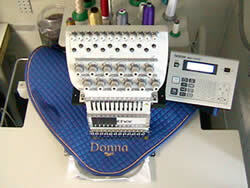 We have the ability to convert your logo to embroidery format and stitch it on the product of your choice. We work with the finest quality threads to ensure that your designs are bright and long-lasting. Our threads are polyester and rayon, guaranteed to withstand washing and wearing. 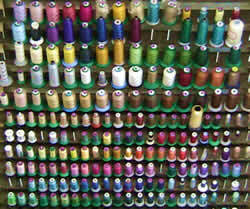 Our "wall of thread" is stocked with Isacord, Madeira and Robison-Anton threads. We can match your company's Pantone® (PMS) colors. We can also work with metallic and variegated thread to make your design sparkle. Ann the Gran link exchange.